The Secretary of Health of the State of Tocantins (SES-TO), Brazil, gathered representatives of their technical fields in a Workshop in order to discuss the “Information and Knowledge Management Plan”, in the context of the Cooperation Term 94 (TC-94) between PAHO/WHO Brazil, BIREME/PAHO/WHO and SES-TO. For each line of action, BIREME/PAHO/WHO presented a proposal of activities to be developed and the participants, divided into groups, discussed and developed a S.O.W.T. matrix (Strengths, Opportunities, Weaknesses and Threats). A total of 18 S.O.W.T. analyses were made, which will be consolidated by the SES-TO and considered by BIREME in the specifications of the projects related to result number 5 of the TC-94. “It was an excellent opportunity for professionals of the different sectors of the Secretariat to analyze the current situation”, said Renato Murasaki, Manager of Information Technology at BIREME/PAHO/WHO. 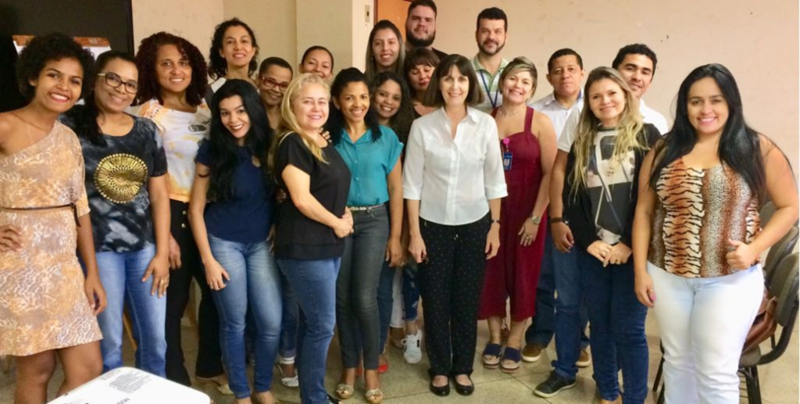 Veronica Abdala, Manager of Cooperative Information Services, highlighted that “opportunities for cooperation with BIREME and PAHO/WHO Brazil through the Center’s products and methodologies, such as LILACS, DeCS and the VHL, were recognized during the Workshop”. In the context of the cooperation of BIREME/PAHO/WHO in the TC-94, two editions of the Communication and Scientific Writing course were held in April and May. “An innovative component in this project,” said Dr. Lilian Calò, Coordinator of Scientific Communication in Health at BIREME, “was the inclusion of scientific article writing activity for the students of the first workshop”. They produced their articles during the interval between the two courses and the articles were reviewed and evaluated by the instructor during the second workshop. Participants expressed their impression of the course through online evaluation questionnaires, which were answered anonymously. Of the nearly 70 participants, 29 responded the survey. The course was evaluated as excellent (41,4%), very good (31%) and good (20.7%). For 90% of the students, the content was totally or partially new. Sixty-nine percent of the participants affirmed that the content presented is relevant to their professional development, and all of the respondents believe that the course will henceforth allow them to write better scientific articles and documents. The personal impressions of the course were varied, but in general, the participants were satisfied with the topics addressed, the methodology, the exercises and the practical part of the course, to an extent that they asked for a new Workshop the following month. Some participants, however, would like the duration of the course to be longer, in order to address some of the topics in more detail.